Apologies for lack of pictures. Frankly, I figured I’d take the pictures in reverse order when putting stuff back together since I didn’t know what to take a picture of when it was coming apart. But it was really cold when I was doing this and I had gloves on which I didn’t want to keep taking off to use a camera. I’ll update this post with more pictures when/if I take it apart again to move the dock. I’ve udpated the post with pictures now, however I still need to apologize for skipping a few times when I should have taken pictures. I get in a groove with taking stuff apart and forget to take a second to take a picture. Click on a picture to make it full size. First remove everything from inside the car. This is going to be a fairly big undertaking and the emptier your car is before you start, the better. Especially important is to empty the console bin. 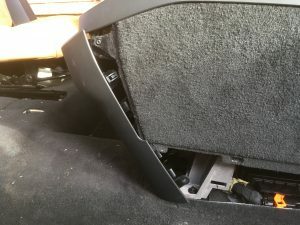 Remove all three of the rubber bottom console mats – one inside the center console, one in the cupholder area, and one in the front compartment bin. Remove the floor mat from the passenger side front. It would probably be useful to remove the passenger side rear floor mat too because there’s going to be a lot of little screws and things that could get lost under the lip of the car mat. 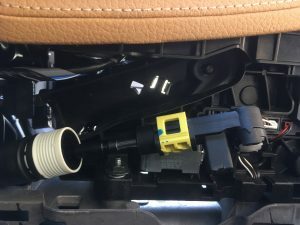 Also, make sure you have plenty of space to put the pieces you take out – I emptied my trunk and had the 3rd row seats folded to do this so I could stage all the parts coming out. Having a table set up to keep track of the screws that come out is a smart move that I didn’t do and wish I had – take a scrap of paper and label it with info about the area where a set of screws came from so you know where to put them back. Next remove the forward console side panel on the passenger side. This is one of the easiest parts. Just work your fingers under the panel’s bottom edge or use a plastic pry bar and pull. It will pop out and then down and forward. Repeat on the driver side with the driver seat slid backward. Next we want to tackle the remaining console side panels but there is a screw hidden by the the console back so we need to get that off first. And this is a tough one. 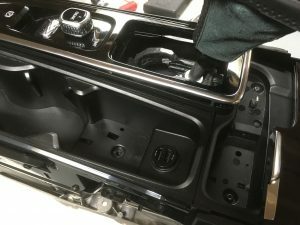 First, find the one screw (on each side) that is now visible after removing the smooth plastic bottom rear console side panels. Now the console back is theoretically loose but it is captured underneath the top console trim. And if you angle the bottom out rearward, you only end up getting it further stuck because the part is longer than the space is tall (you’ll see what I mean when it is in your hands). I found that you can cheat the bottom of the console back further forward over the screw mounts where you just removed the screw and that frees up the top — not quite enough. But then you can use your fingers and simultaneously pull up on the console while prying out the winged plastic top of the console back for the passenger side. Repeat on the driver side. 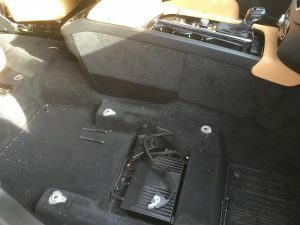 Then you can get the console back separated enough that you can disconnect the wires from the back of the power socket. With that removed, now the screw for the upper back console side panel is visible and can be removed. Then the panel will slide down and out easily. Repeat on the driver side, again moving the seat back and forward as needed to access the panel. Look for a grey electrical connector on the passenger side to disconnect. The release is on the side facing away from the passenger side but you can feel it with your finger and it is a bit stiff to disconnect but it should come apart with pressure. On the driver side, there is a different electrical connector to disconnect. 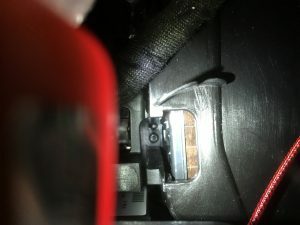 This one is a lever connector too so just get your finger under the white plastic part and pull forward and the connector should freely release. Where the amplifier came out, look for a seam in the carpet and pull the forward part of the carpet forward. At first you’ll only peel some of it forward but as you keep going, you’ll find that you can pull more and more of it forward and that it was designed to do that. (I.e. if you encounter resistance, you don’t have it free yet.) If you have pulled back enough of the carpet (and foam that is attached to the carpet), you’ll eventually see the other end of that wire from the center console. You are going to need a 10mm socket on an extension so you don’t have to remove the rigid foam floor. And be super careful to not let the nut or any tools fall into the depths below. When the nut is removed, you’ll need to wiggle the silly white plastic basket off and you may need to release the catch to open it up like I did or you may be lucky that yours doesn’t need to come apart. 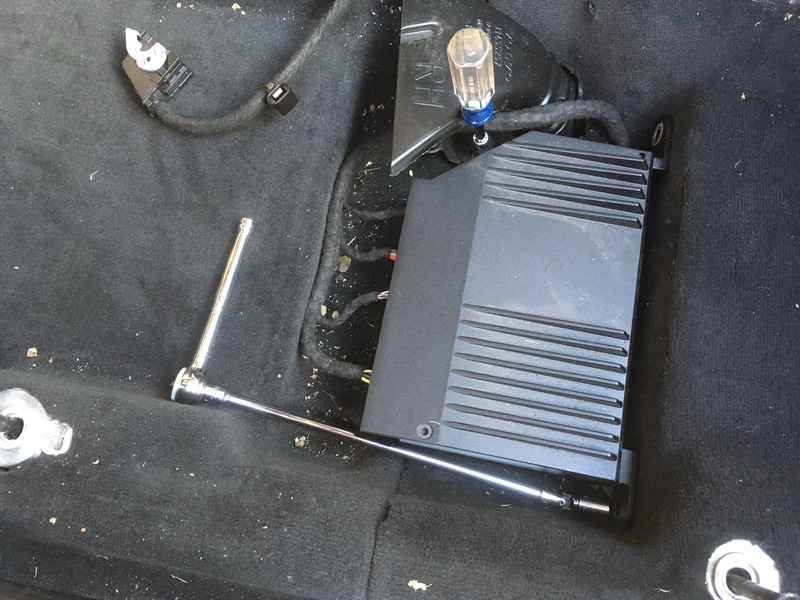 With the wires disconnected, move them out of the way of the carpet and replace the carpet pushing the carpet back around the wire harness to the amplifier and around the vent. Then you can place the amplifier back in place to keep it safe and tuck in the passenger seat connector somewhere to keep that safe too. 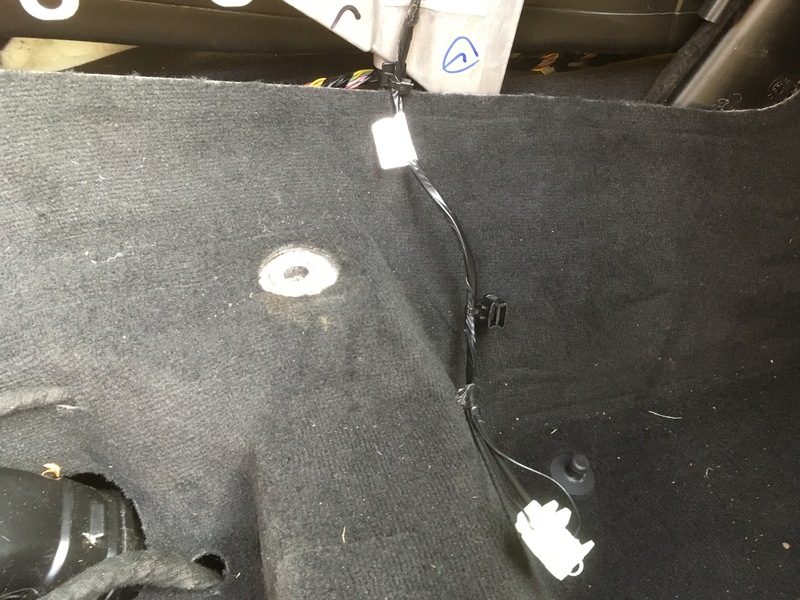 I assume this wire with the basket on the end is a ground wire and as a consequence of removing these wires, you’ll notice that the car is now reporting strange error messages. At one time I saw an error about needing to put the car in park (even though it was) and another time there was something about the car being “active”. I didn’t find any lasting problem with having these errors and they went away when the car went back together. And I could silence any annoying dinging by just closing the driver door. 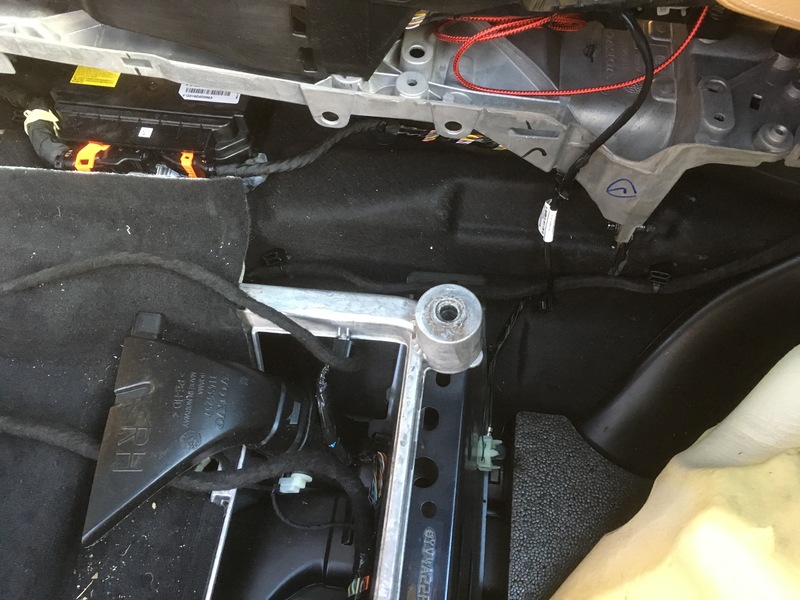 The only thing holding the console in place now is 4 bolts, 2 screws, and one or more wires. 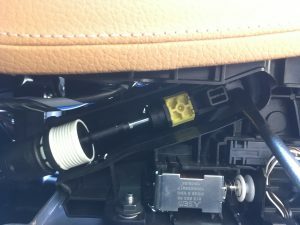 There are two bolts at the back and then one on either side of the front of the console. The two on the back are pretty easy to access and remove using an 8mm socket. The two on the front are a bit more challenging because they are under the top edge of the carpet. And again, be sure not to lose anything behind the carpet there. Finally, there are two screws at the very front of the console on either side. They are Torx T-20 screws and will come out very easily. The console should now be completely free from the car. Remove it from the car to continue disassembly. To fully access the guts of the console, which is needed to access the USB jack area, there’s a lot still to go. For the rest of the steps here, you are going to want a work table with some sort of protective padded soft top – like a moving blanket. Turn the console upside down on the table with the shifter hanging over the edge of the table. 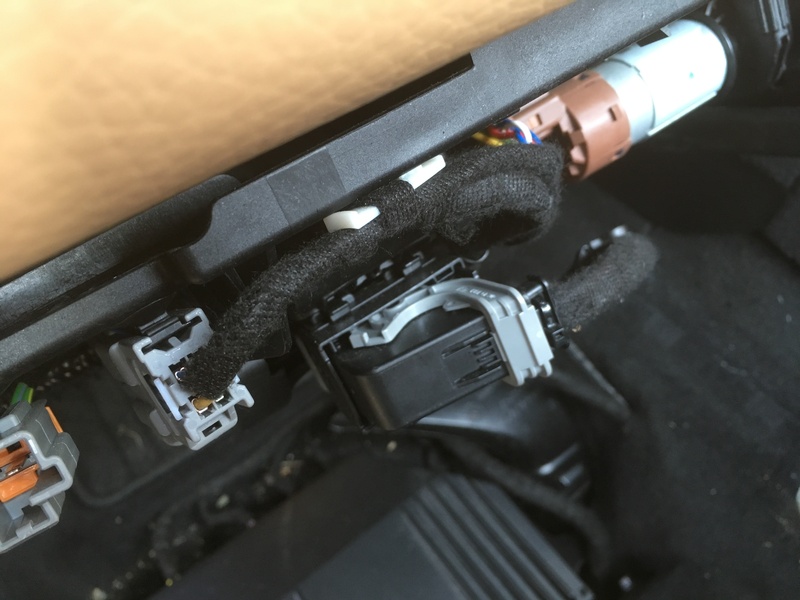 If you have rear climate controls, on the bottom you’ll see a duct that needs to come off with two Torx T20 screws. In fact, all of the remaining screws have Torx T20 heads even though they are different sizes. So track the screws you remove by location and size, not just by the tool you use to remove them. 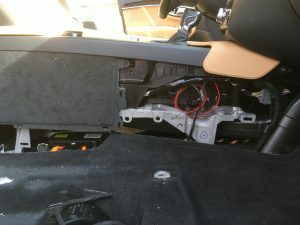 While still upside down, locate the screws holding the leather piece on to the front of the console. There are two screws on the driver side of the console and one on the passenger side. Then turn the console right side up and find the one screw on the front of the leather and remove that. The leather piece can now be removed by sliding forward and up. There are two screws now visible to remove. On the console bin lid, press the small catch in with your finger and use a plastic pry tool to separate the plastic cover from the lid. Then you’ll see 4 screws to remove. The leather lid will then come off of the metal plate. You don’t need to remove the metal plate – that can remain in place fortunately. We need to remove the rear console face. In my car with the rear climate control, that is the area that has the vents. Note that the control pad doesn’t actually need to come out. From underneath, pull the vents upward enough to get a plastic pry tool under and then the rest should pop out. Then there are 4 screws to be removed. Back upside down, there’s a bunch of screws that run down the sides holding the frame in place. Remove all of them. A long driver bit would make quick work of this. (Note to self: need to get one.) And then turning the console back upright, if you have found all the screws, you should be able to pop the frame off. There are two remaining spring clips so pull gently on those and make sure that they are really not other screws you missed. 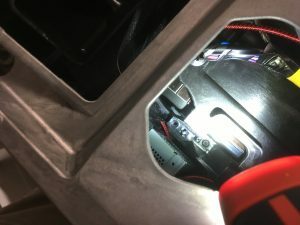 With the frame off, you can now finally remove the console top. 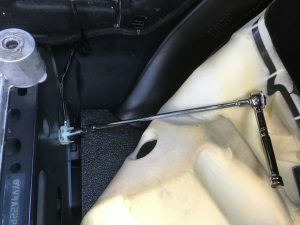 First, use a pry bar at the front of the leather shifter boot to pry back the catch on the plastic hidden frame. 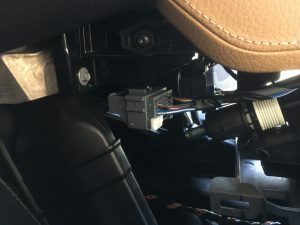 It will pop up and you can then pull the shifter boot around the shifter head. Turn the console back upside down (being careful to keep the shifter off the edge of the table still) and look for two screws buried way deep inside. You’ll need a flashlight to see them. They are in deep wells that would be covered by the AC ducts if you hadn’t removed them earlier. Be sure you are using a magnetic driver and remove those two screws. 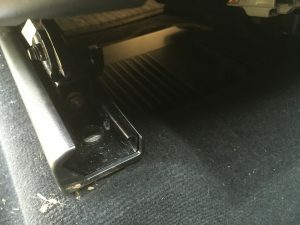 Turn the console right side up again and pull up at the front of the console top to release that spring clip and at the back to release that spring clip and the console top should now be free. By turning and twisting, you can work it around the shifter and shifter boot. 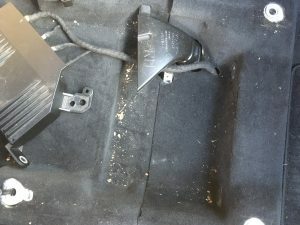 Now the cupholder assembly can be removed by unscrewing the remaining screws holding that in place. And disconnect the light connector. 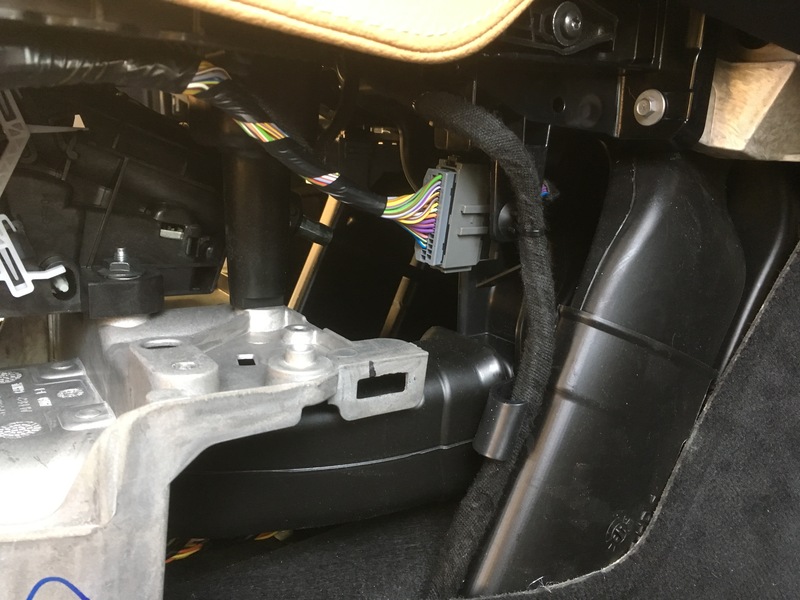 And finally, you can now see the USB connector module. To remove it, find the catch at the bottom back of the USB module face and release it so that it hinges up from the bottom and then the top can fall out. Disconnect the two connectors on the USB module. 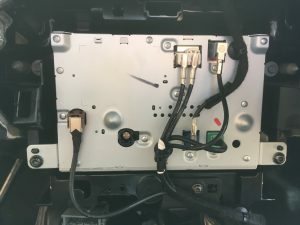 The result is a console that has been disassembled enough that you can get at all of the USB connector and wiring.